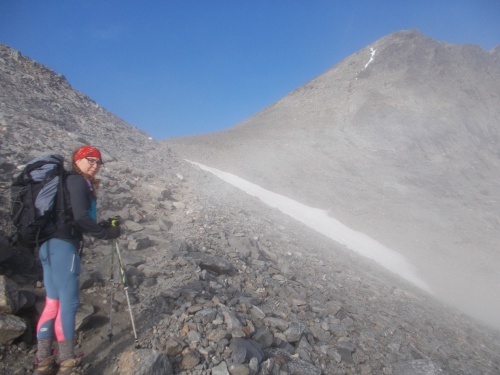 Once again, Karolina wanted to write a guest blog post about the day we summited Kebnekaise--the highest point in Sweden and the Scandinavian arctic! My alarm clock went off at an ungodly hour of 5 am. I had promised to Ryan that we would be up and hiking by 7 am and knowing how slow I am getting ready in the morning, I decided to wake up well in advance. It worked and around 6:30 I was ready to hit the trail. 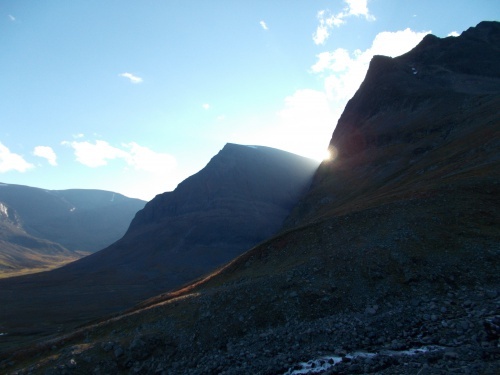 Today would be a challenge—we were going to summit Kebnekaise—the highest mountain in Sweden. 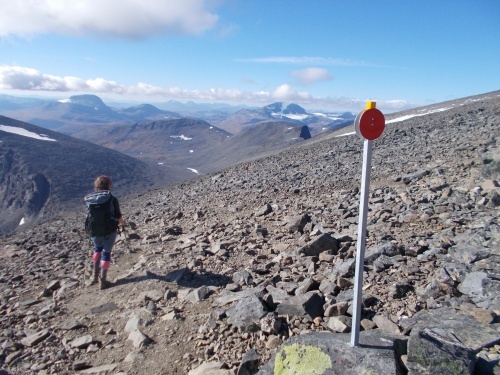 I had hoped we would be able to summit Kebnekaise ever since I started preparing for the Kungsleden. Whether that would be possible or not would depend strongly on the weather conditions. 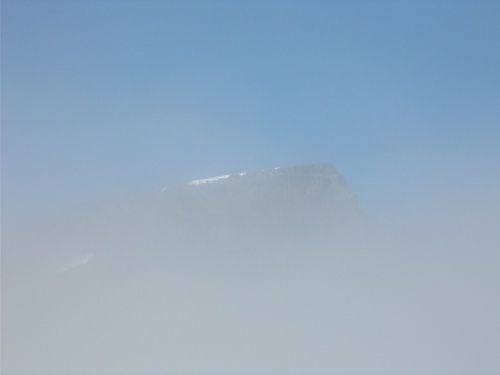 As it turned out, we were very lucky—the weekend when we happened to be near Kebnekaise was supposed to be beautiful and sunny, with cloudless skies and perfect conditions to reach the summit. 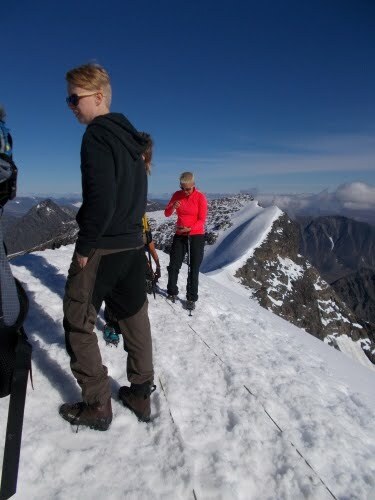 Of course, those perfect conditions combined with the fact it was a weekend would mean the trail might get quite crowded—understandably, there were other many people who wanted to grab the opportunity and set their foot on the highest top in the European Arctic! 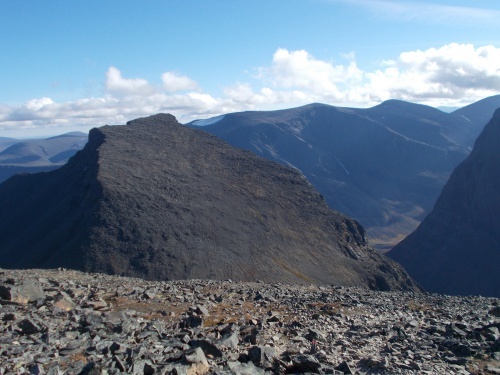 The top of Kebnekaise can be reached by two main routes starting near the STF Kebnekaise Mountain Lodge: Västraleden or the Western Way and Östraleden or the Eastern Way. 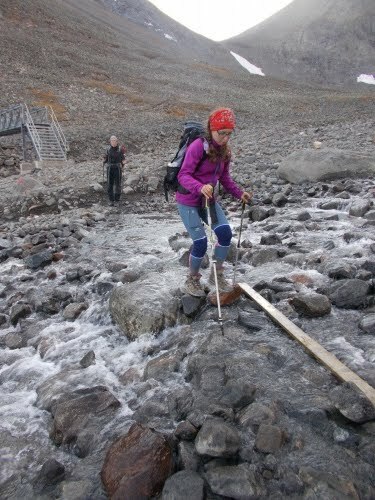 Östraleden is shorter but the trek includes traversing a glacier, therefore this route requires an experienced guide, proper traction devices and other specialist equipment. Västraleden is accessible to regular hikers, and this was the route Ryan and I would follow—all the way up and back down again. We were going to return to the same camp where we stayed last night, so we could leave the bulk of our gear there and hike light today. To reach the top we had to cover a distance of 8 km (5 miles) and a total elevation gain of 1800 m (5,900 ft). 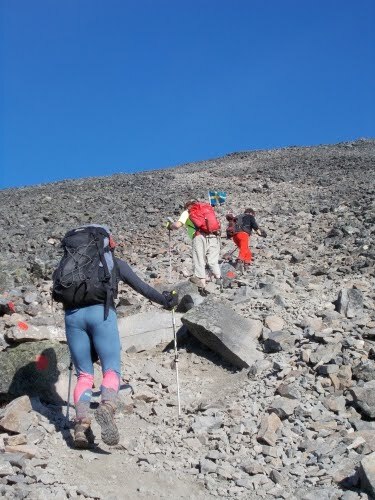 According to the Swedish Tourist Association, the expected hiking time of the round- trip hike was 10 to 14 hours. The first part of the day’s hike was rather easy. 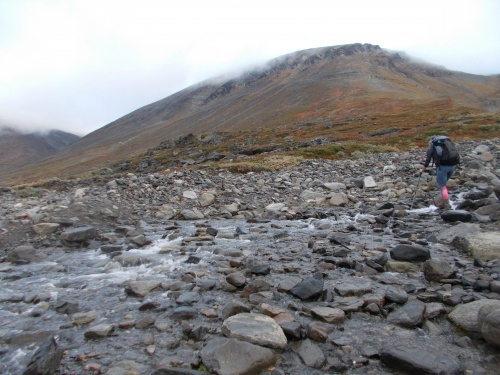 The trail led gently upwards for a couple of kilometers until it reached a canyon created by a torrential glacial river. There it became much steeper, leading up along the river. Even though the weather forecast for the day predicted a cloudless sky, the day had started foggy. 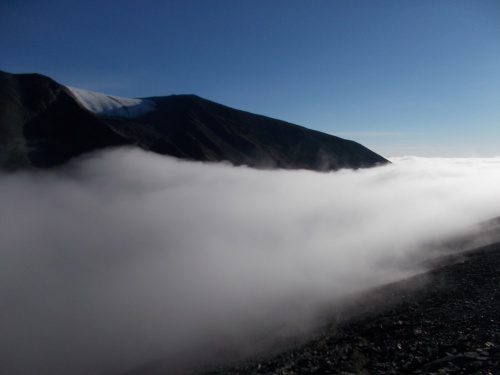 There was fog behind us, in the valley above which we had set our camp, and there was fog above and in front of us, covering the mountains that we would soon enter. About two hours into our hike, we entered that dense fog. We couldn’t see little except of our closest surroundings. We could see the trail and we could tell it was going up—but other than that, we were oblivious to what was around us. Which is why I was surprised when the fog started to burn off, and Ryan pointed out a tiny hint of the massive mountain behind it. I screamed, “Oh! There are mountains here!” which made Ryan laugh. =) With a couple of more minutes, the fog continued to burn off and I suddenly saw vertical walls of high mountains from which dropped a large glacier tongue. It almost felt like they had jumped out at me! 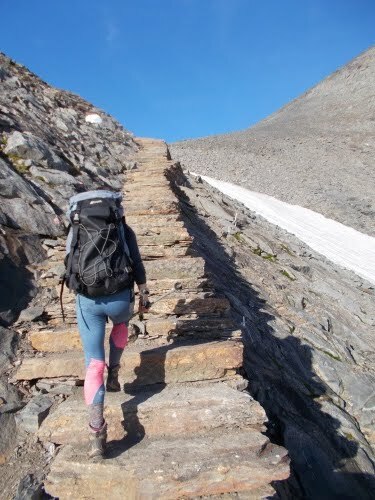 Farther up the path, the trail turned into…steps! They were built from large slabs of rock. 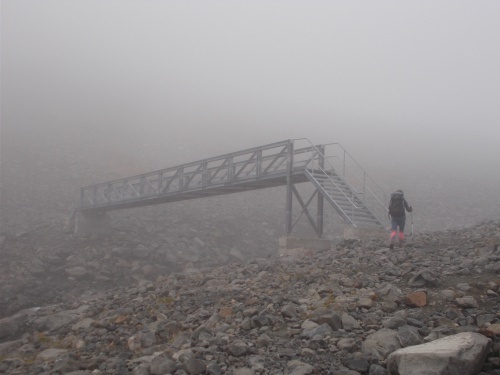 An information board placed at the beginning of the ‘staircase’ explained that this section of the trail was being upgraded in order to counteract erosion, improve hikers’ safety and make Kebnekaise more accessible to outdoor tourists. 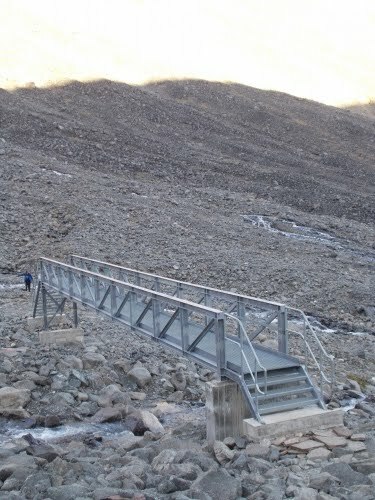 The work was being done by a team of Nepalese Sherpas and Norwegian specialists experienced in building trails in high mountains. 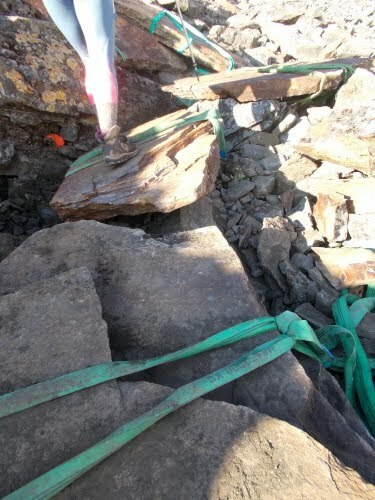 They were choosing the right rock slabs, transporting them to Västraleden and putting them in place to make the stairs. 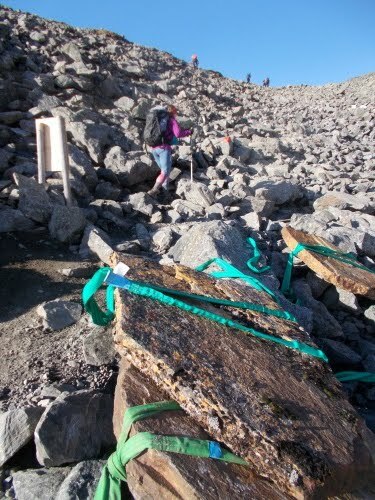 Ryan pointed out that the slabs looked very different from the surrounding rocks—they must have been transported here from other places, probably carried by a helicopter. Just imagine! A helicopter flying with a super-heavy slab of rock attached to it—how? Dangling on a rope? In the valley below the trail, we could see the base camp of the trail crew. It was empty –on weekends, the crew was usually free. We suspected a helicopter must have picked up them last night and taken to civilization where they could take a shower, eat good food, sleep in a bed and generally entertain themselves—the regular things hikers and mountaineers do when they get off trails and mountains. About an hour after passing the trail section with stairs Ryan and I finally reached… a high point. There the path descended several hundred meters down into another valley on what looked like an almost vertical rock wall. From the bottom of that valley, it would start going upwards again, several hundred meters up another almost vertical rock wall. I looked at that with terror in my eyes, almost doubting I could go down and up on such steep trail and cover such a prominent elevation difference. Seeing my face Ryan patted me on the shoulder and said “C’mon, you can do it!.” He reminded me that I had gone up and down steeper and higher mountains and passes—Mount Whitney and Bishop Pass in the Californian Sierra Nevada being just two of the examples. And Ryan was right. 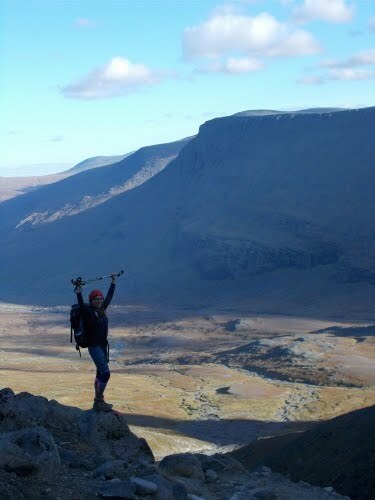 I went down into the valley without major problems, albeit slow—going down steep slopes is a killer to my knees! At the valley bottom we passed a few camping spots – probably used by people who fancy watching sunrise from the top of Kebnekaise—as well as a patch of pink snow. Going up went without problems, too, although we took a break along the way to rest, eat snacks and enjoy the spectacular mountain vistas. By now, the fog had burned off completely and there was not a single cloud visible in the sky. One of the Swedish men who passed us while we were taking a break commented that such great weather occurred in that area only a few times in a year. We were really lucky! 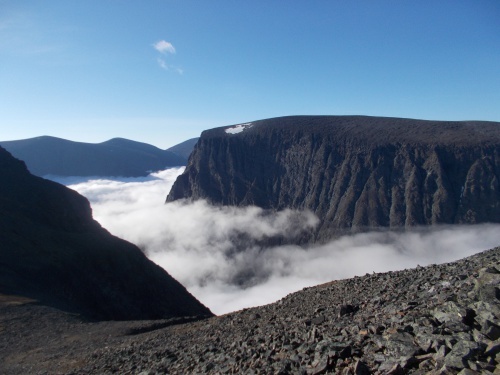 The Kebnekaise summit pokes up into a relatively sharp point. 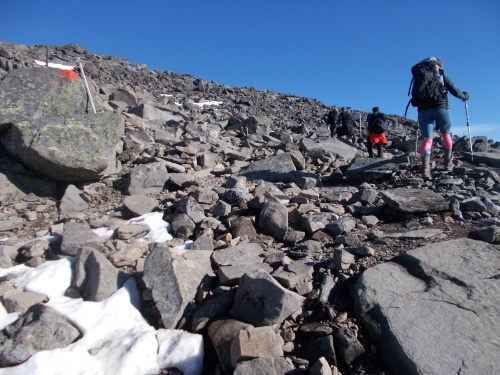 As we approached the glaciated top, dozens of people were milling around the rocky plateau and new groups were entering it. A bunch of people was standing on the top itself. 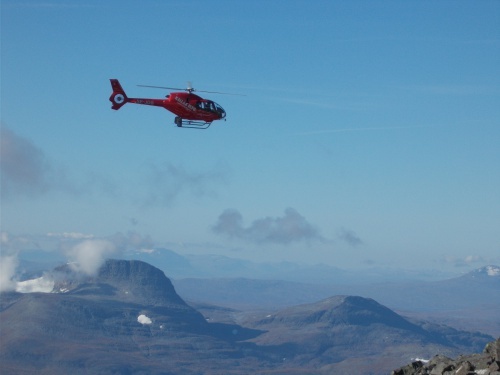 A helicopter was flying around and just as I was at the foot of the snowcap, it hung suspended in the air above my head. That was quite scary, having a helicopter hovering right above me, so I rushed forward. Suddenly a strong gust of wind struck me in the back. I ducked, covering my head. With a corner of my eye, I saw a jacket and a small backpack flying past me. (It was left unattended by a hiker who was making his final assault on the summit.) The helicopter caused the sudden violent wind as it landed nearby. A few minutes later, the helicopter took off again, once again causing wind which sent snow and some hikers’ belongings into the air. We continued our climb to the top. 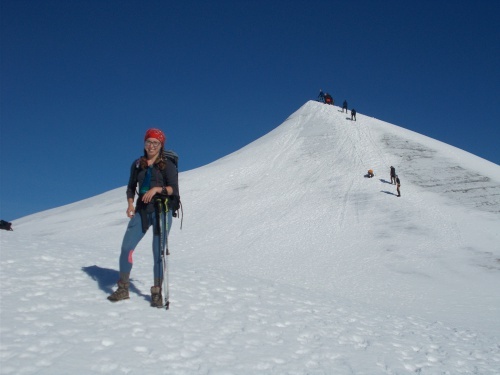 It was a real climb now—each step required digging our feet and trekking poles into the snow so we wouldn’t slip and slide back down. 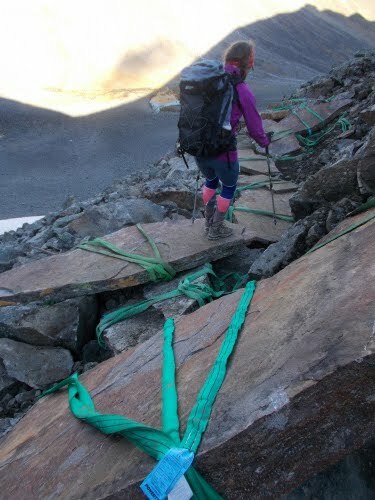 Although sliding down the way we came up might be painful, sliding down the other sides of Kebnekaise would be deadly. I realized that as soon as I reached the very top. Even though there was very little room there, quite a bunch of people were milling around trying to take the most spectacular selfies. I dug my feet into the snow to increase the stability of my position. I froze in one place and moved only the upper part of my body, taking photos of the surroundings. I decided to pass on walking out to the spot where most people were taking selfies with the most spectacular backdrop—I judged that as too dangerous and chose my life over dramatic photos. Ryan was even more aware of the danger we were in—right there, on a narrow, snow-covered mountain top crowded with tourists, having steep, slippery slopes going several hundred meters down towards hard rocks on both sides, without any traction devices. 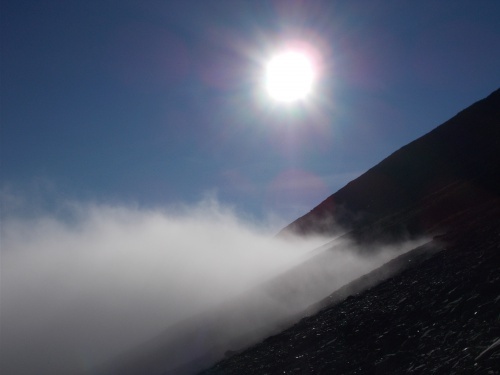 Additionally, Ryan was worried the helicopters, which kept on coming in and going out would fly too close to the top, causing gusts of wind that could push us off the summit straight into the arms of death. So Ryan started going back down immediately upon reaching the top. I followed him a few minutes later. The way down the snow cap wasn’t easy and I was very careful to not slip and fall. Especially not fall face first—I didn’t want to lose a few teeth or breaking a leg. 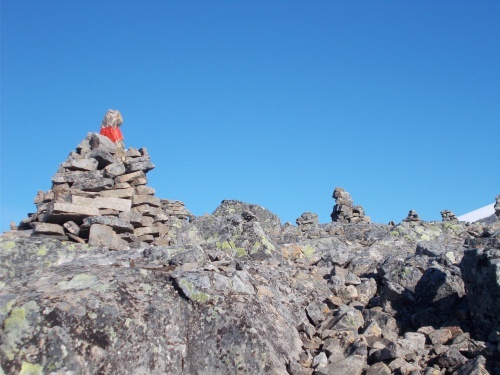 Karolina is about to climb to the high point... err, I mean second highest point in Sweden! If only we arrived a month or two earlier, it would have still been the high point. 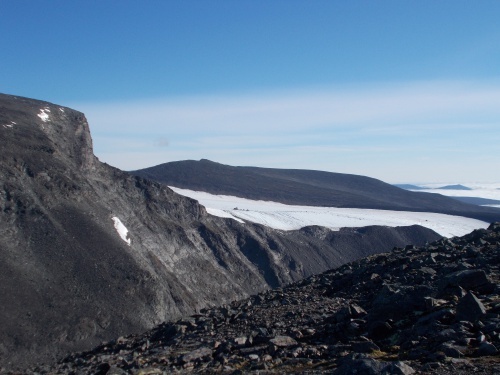 Back at the rocky plateau, we decided it was a good moment to take a lunch break. We sat down on rocks in the midst of snow, ate snacks, read a book and rested. We watched more helicopters flying by, landing and taking off. 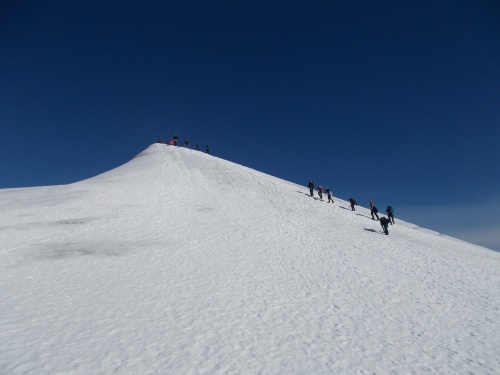 We watched people going up and down the summit, including several organized groups led by professional mountain guides who came from the glacier route. 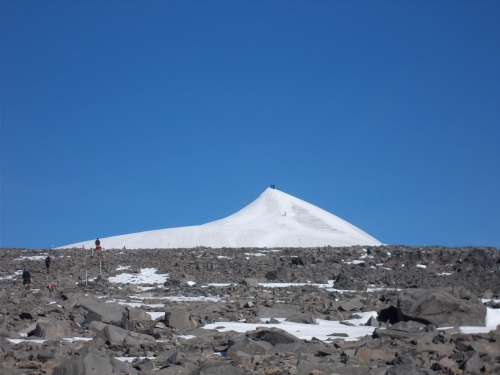 They were all equipped with crampons and helmets and went up and down the summit with the help of ropes anchored deep in the snow. 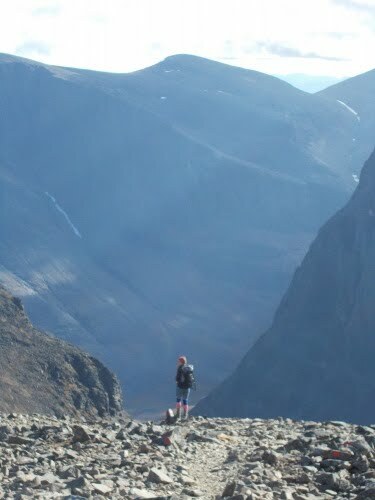 Going 1,800 meters down from Kebnekaise back to our camp was a killer to my knees. I was moving slowly and needed a few breaks to rest my hurting joints. There was no fog and visibility was great, so now we could see all the views that were obscured on our way up. 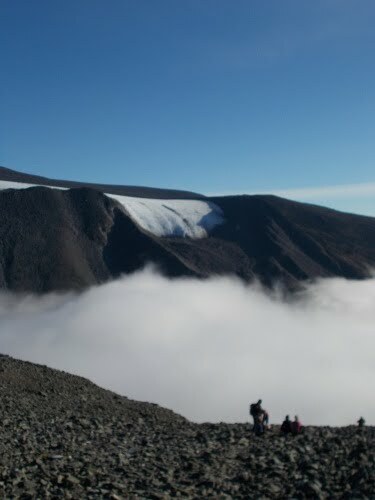 Far in the distance, Ryan even managed to spot a group of people traversing a glacier on the Östraleden. 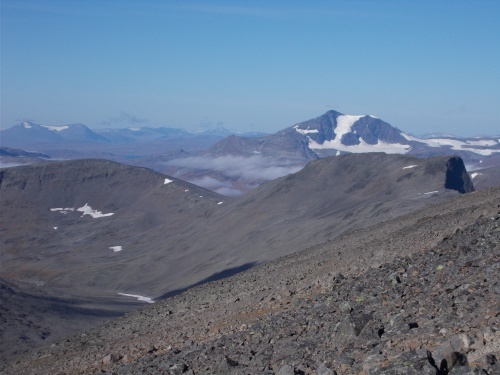 A round trip to Kebnekaise and back took us 12 hours. Being back in the camp, I felt tired but happy. All in all, it had been a very satisfying day! Not mentioned in Karolina's blog post, we made a point of checking the night sky for the northern lights whenever we woke up during the night. I took this photo when I noticed a faint light on the horizon but couldn't tell if it was light pollution from a distant city or an actual aurora. 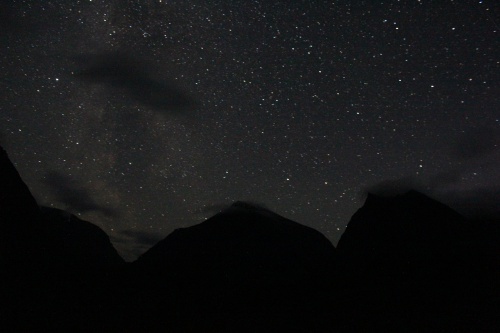 But the distinct lack of green in the light makes me think that no, no aurora this time. It was still beautiful, though! The fog in the morning was terrible! The fog is burning off! The trail will climb to the top of the mountain on the right--before descending hundreds of feet to resume it's march even higher. We made it above the fog layer even before the fog has burned off. These steps were still under construction! But workers had the weekend off so nobody was working when we passed by. 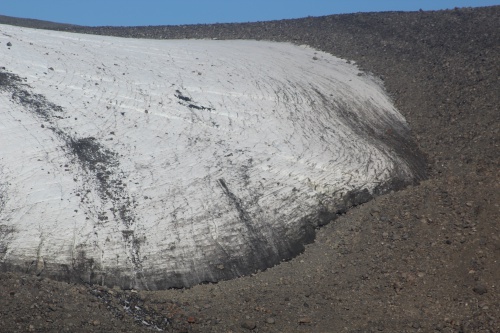 A close-up of the glacier's terminus. The trail was super steep and had very loose footing after we passed the steps. We imagine that the steps will eventually be extended up to this point because it could really use some! The most demoralizing point of the day was when we reached this point and could see the trail descend the large gap ahead before rising up that mountain on the left. 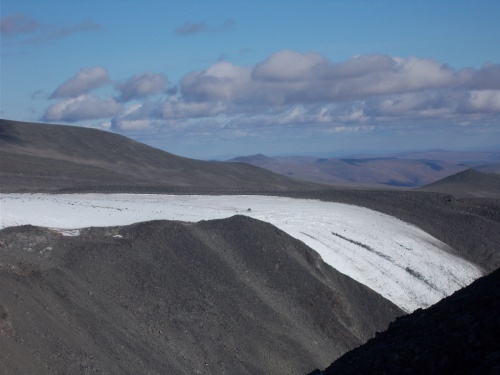 For those who took the guided tour over the glacier, this was the glacier they would walk over. The trail comes very close to Norway. 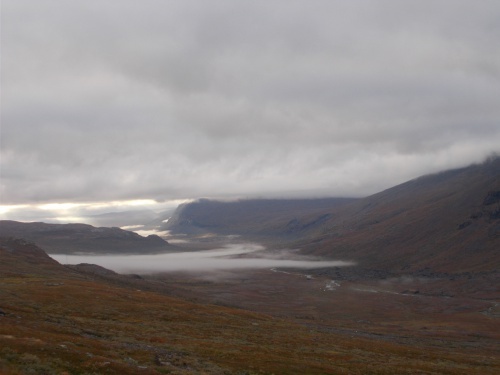 That tall, glacier-covered mountain in the distance is still part of Sweden (the Kungsleden Trail goes directly in front of it--which you'll see photos of in the next blog post). But pretty much everything behind it is part of Norway. 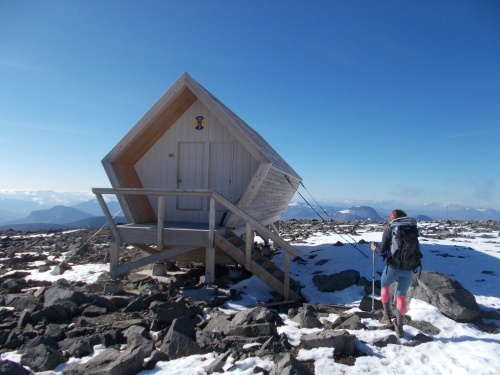 One of two huts for people to get out of the elements on the way up Kebnakaise. The "elements" today were wonderful, though, and we felt no need to get out from it! 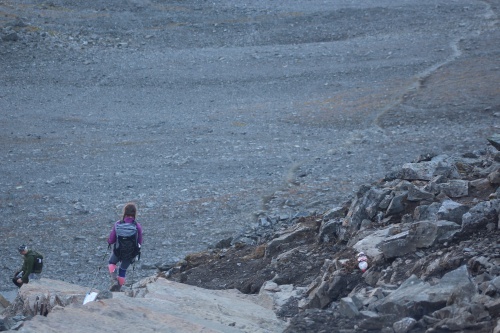 Karolina coming down from Kebnekaise! 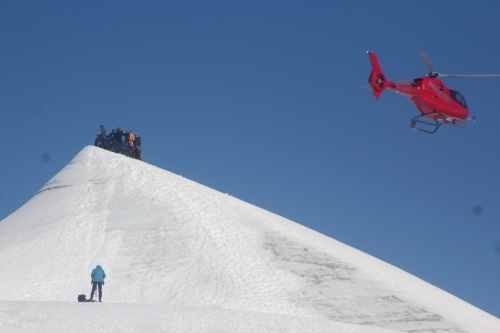 Helicopters would fly awfully close to the summit! Which I didn't like at all! 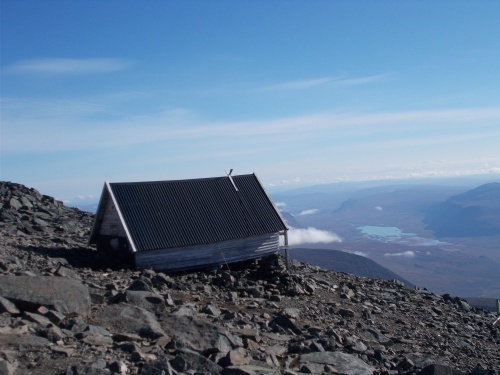 The second of two huts near the top. Back down to the steps that were still under construction.